Compact cameras are timeless. They might not be as advanced as DSLRs and mirrorless cameras but they sure are better than most smartphone cameras these days. You can carry a compact camera basically anywhere without having to worry about bulk, changing lenses, tripods, and huge camera bags. All you need is a nice strap to hang around your neck or your pocket where you can place your camera and you’re good to go. Compact cameras are for people who are always on the go. You just need a single click of your shutter button to capture the right moment. But do you know that these cameras can also bring out the best in your pictures? They come with multiple scene modes so you can experiment with various types of photography including landscape, portrait, and macro. 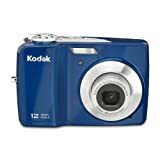 The Kodak EasyShare C182 is an entry-level compact camera with an outstanding 12.20-megapixel resolution and a 3x optical zoom to give you clear and crisp images every time. It features a big, bright 3-inch LCD screen to let you frame and view vivid shots. By just looking at the controls of the Kodak EasyShare C182, you can tell that this compact camera is extremely easy to use. Its front view features the lens, self-timer, microphone, and flash. At the top view, you’ll see the mode dial, shutter button, flash button, and power button. The back view of the Kodak EasyShare C182 accommodates its big and bright 3-inch LCD screen, zoom buttons, delete button, menu button, info button, arrrow buttons, share button, and review button. Because this camera has a 16MB internal memory, you can insert an external memory card in the SD/SDHC card slot found at the bottom of the camera. Beside it you’ll see a tripod socket where you can install a tripod to get more stable shots especially when you zoom in or take a panorama photo. At the right side of the camera, facing the rear view, you’ll find the USB port and strap post. To help you carry your camera with you no matter where you’re going, hang a nice strap post around your neck or keep the Kodak EasyShare C182 in your pocket. It only weighs 4.41 oz and doesn’t take a lot of space. The Kodak EasyShare C182 may be an entry-level compact camera but it sure gives you the best photo results you’re looking for. It produces high-resolution 12.20-megapixel images and a 3x optical zoom so you can enjoy maximum clarity and sharpness while zooming in and out. This camera corrects red-eye, a common problem when using the built-in flash. It may not have an Optical Image Stabilization system that bridge cameras have but it achieves the same clear results through its Blur Reduction mode. For close-up photos, choose the Close-Up mode. Remember that when using this, shoot in a well-lit environment to get the best details of your subject in focus. Take pictures in almost any situation without dealing with difficult terminologies like aperture and shutter speed. Simply turn the mode dial to SCN and use the arrows to view the description of every scene mode. Here are the following modes to choose from: Portrait, Panning Shot, Panorama (L-R, R-L), Landscape, High ISO, Flower, Night Landscape, Sunset, Night Portrait, Candle Light, Self-Portrait, Children, Fireworks, Manner/Museum, Text, Snow, and Beach. The Kodak EasyShare C182’s built-in flash will come in handy if you have to take photos in dim environments. Unlike an external flash that requires separate batteries, a built-in flash will always be there for you. What’s great about having a built-in flash is the fact that you are not required to have separate hot shoe flashes that take space and add bulk. Know that a built-in flash is not only used at nighttime. Weird as it may seem, you can use it in broad daylight to add more depth to your subjects and brighten up dark shadows. This camera is powered by two AA batteries that are easily replaceable and quick to find. There’s no reason why you can’t have spare batteries to make sure you don’t miss out on the best shots. Because the Kodak EasyShare C182 does not have an electronic viewfinder, its LCD tends to consume battery power fast when in use. Its built-in flash does the same thing too. So it’s best to have those extra pair of batteries with you at all times. Overall, the Kodak EasyShare C182 is a handy, convenient entry-level compact camera that gives you generous results. It may look simple but it is equipped with high-end features that are difficult to match by any smartphone camera. You don’t need to edit your photos manually in your computer because the Kodak EasyShare C182 gives you full control over beautifying your shots with color effects and scene modes before having them printed. It is also worth mentioning that as a standalone camera, the Kodak EasyShare C182 is highly affordable. Lastly, you can select from its choice of 3 colors: red, silver, and blue. The Kodak EasyShare C182 is a handy, convenient entry-level compact camera that gives you generous results.